"Remember that guy that ate half our biscuits? He didn't seem to be in a hurry to clear out. Maybe he stayed and saw Cap." "Or the sasquatch," Di fretted. Hallie scowled but didn't scold. She simply shrugged. Trixie hid a smile. When Hallie had visited Crabapple Farm, she had been "best friends" with Di. Even her, in an Idaho forest, Hallie had chosen Di for a tentmate. So what does that prove? Trixie asked herself. So far as I can see, it proves that Hallie adjusts to a mansion better than Di copes with a forest. But that doesn't change the fact that Hallie and Di really like each other. It's a good thing they do, because we're in enough trouble as it is. With every step they took, Hallie and Di kept up an edgy give-and-take that just missed being an argument. Neither Trixie nor Honey interfered with what they both recognised as merely nervous chatter. Hallie started immediately back through the thimbleberry and syringa bushes to the road. But when Di got her hair caught in the underbrush, Hallie was the first one there to help her get it untangled. Trixie was surprised at how very patient and cheerful Hallie was as she worked on the snarl in Di's black hair. "You should see the syringa in June," said Hallie. "It's Idaho's state flower. It's white and waxy and smells like orange blossoms. In fact, it's called mock orange." "If these bushes make orange blossoms, remind me not to have them at my wedding," said Di. 10. One Sasquatch - or Two? Champion Creek - Joe Country, Northern Idaho. The Bob-Whites (minus Dan) and Miss Trask join the Idaho Beldens for a camping trip in Northern Idaho. However, a fun camping trip turns into a nightmare with the appearance of the mythical sasquatch and the disappearance of Cap Belden. Was Cap really taken by a sasquatch, do sasquatch's really throw stones and could there be more than one sasquatch? These are the questions Trixie and the Bob-Whites must answer as they fight to protect themselves and find their missing friends, Cap and Tank. Ron Duncan - brother of Knut's girlfriend, Gloria. Opie and Fred Swisher - brothers who wanted to kill a sasquatch and steal Tank's gold. The book commences on a Monday night in August, Hallie's parents were in South America and Dan stayed home to work as a counselor at summer camp (p. 14, 16). This is strange as the other boys, except Dan, worked as counselors in the previous book which was also during the summer holidays. Knut (real name Knutson) is over 6ft tall and looks enough like Brian to be his brother. Trixie hadn't seen him for years (p. 15). He also wears glasses (p. 76). Cap (real name Capelton) had long brown hair tied with a leather thong at the nape of a strong neck (p. 15) and brown eyes. Trixie thought her father would disapprove of his ponytail. He is 16 years old (p. 210). Trixie tells Hallie that 'Dan said to tell you 'hi'. He wishes he could have come' Hallie replies 'Thanks, Trix. I was kind of hoping he could, too' (p. 17) Dan is not mentioned again. Hallie is still thirteen and is described as beautiful and 'Trixie doubted she would ever be able to overcome a niggle-naggle of jealousy' where Hallie was concerned (p. 17-18). Knut has a girlfriend named Gloria, who he plans to meet up with on the weekend to go to a drive-in movie (p. 62). Cap and Mart fight over Mart eating in the tent and Cap storms off. 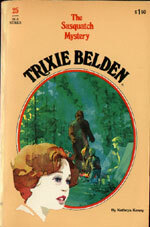 Trixie is embarrassed, but Hallie tells her to stay out of it (p. 85-86).